Looking to buy candy filled Easter Eggs, we can help. It's that time of the year to start planning your Easter Egg hunts. There is nothing more fun that watching a bunch of kids running around grabbing up plastic Easter eggs filled with candy. The excitement of the event and watching their faces when they pop open the eggs and find their sweet treats is priceless. We have been filling plastic Easter eggs with candy for over 20 years now with great success. 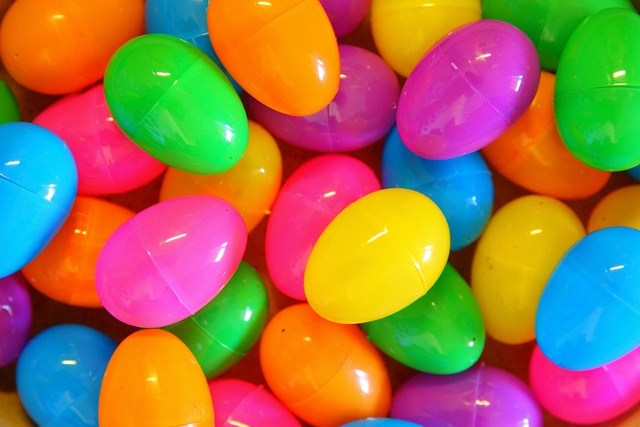 We have many companies come back to us year after year for help in making their Easter Egg hunts a huge success. We have many different ways available to buy candy filled Easter eggs to fit your needs. If you are just looking for a few eggs to throw in your backyard we sell them by the dozen. If you are planning a larger event you can purchase them in 250 or 500 count. We also sell them in 1000 count wholesale candy filled eggs, for those corporate Easter Egg hunts. Our eggs are filled as they are ordered so they are not sitting in a warehouse for months getting dusty and the candy getting stale. Each egg has 3 pieces of candy and then are taped shut to keep them from opening during shipping. I can't tell you the horror stories we have heard from customers who have ordered eggs from other companies and when they arrived half of them or more had opened in the shipping. We use a variety of different candies to fill our eggs. You get Bit O Honey, Jolly Ranchers, Swedish Fish, Now and Later, Sour Patch Kids, Smarties, Razzles, Bazooka, Frooties, Mini Tootsie Rolls, Hard Candies and Salt Water Taffy just to name a few. You never know what candy your are going to find until you open your eggs. So if you are planning an Easter Egg hunt and looking to buy candy filled Easter eggs give us a call. We can help you make your Egg hunt a success too.